If you’re an existing homeowner or an aspiring one, you may have heard the phrase “house poor,” typically uttered by an overextended borrower. It may also serve as a warning to a first-time home buyer. First, let’s define what it means to be house poor. At first glance, it might sound like someone who lives in a small or meager dwelling, but this isn’t the case. And other housing expenses like utilities, maintenance, etc. It’s actually quite the opposite – someone who is house poor has likely bitten off more than they can chew, and is spending too much of their income on housing payments. This means they could have purchased a McMansion and don’t have much left over for other recurring costs, or even everyday expenses. It could also mean that they took out a mortgage that was too large for their salary, even if the property is more modest. It’s really dictated by a borrower’s ability to make housing payments each month, not necessarily the grandeur of the home, as budgets will vary by financial situation. For example, a really wealthy individual could buy a multi-million dollar home, but struggle to make mortgage payments because their lifestyle is too extravagant. At the same time, someone making less the national median household income could buy a much cheaper home, but still be house poor. In other words, both rich and less rich people can be house poor, assuming they bought a property out of their price range and can’t handle the related housing expense. It’s important to know your price range, so to speak, when setting out to buy real estate. This isn’t a guessing game, but rather a fine science that requires mortgage calculators and a pre-approval to determine affordability, appropriate loan size, loan type, down payment, and so on. What I see all too often is a prospective homeowner going out of their price range to purchase a home they just must have. Often, it starts innocent enough, but before long, curiosity gets the best of them and they slide that maximum price button higher in their favorite real estate app. Nowadays, this can also be the result of a bidding war, where the list price was in budget, but the actual offer price creeps higher thanks to competition from other buyers. Unfortunately, a lot of future home buyers don’t factor in all the hidden costs of homeownership, and even the not-so-hidden costs, which just exacerbates the issue. If you’ve never owned your own home before, you might be in for a rude awakening. Do you recall your mom and dad telling you to take shorter showers, or to close the fridge door, or to turn off the lights! There was a reason for that – all of those actions result in higher utility costs, which can be really expensive even if you’re super conservative. You may get bonus points for looking beyond the principal and interest mortgage payment by considering property taxes and homeowners insurance, but what about the water bill, trash pickup, gardening, heating and cooling, and regular home maintenance? If you were previously renting, your landlord may have covered some of those bills, and anything that broke probably wasn’t your responsibility. Not so when you own the property. This illustrates the danger in moving outside budget, which is sadly pretty common. It’s one of the tenets of personal finance that is constantly broken. 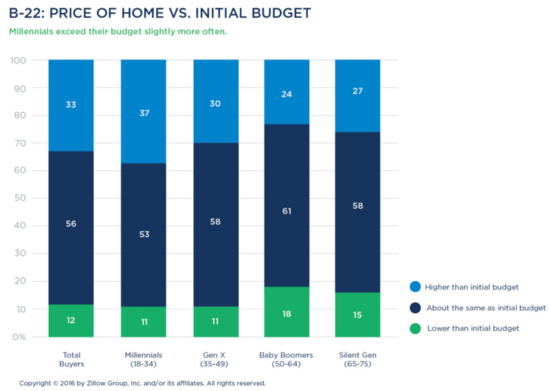 Zillow studied this back in 2016 and found that a third of home buyers exceeded their initial budget, with 39% of first-time home buyers guilty of doing this. You can also see from the chart above that Millennials (sorry, it’s always this group) were the most likely to go over budget. The takeaway is that one can become house poor in a variety of ways, whether it’s deciding to pay more than originally planned, or for failure to factor in all the costs of homeownership. In fact, a homeowner could get hit twice, by going over budget home price-wise and not budgeting for these costs. This can spell big trouble down the road. For the record, home prices and mortgage rates have only gone up since 2016, so my assumption is the number of home buyers going over budget has just worsened. First things first, what you can afford according to lender guidelines and maximum debt-to-income ratios (DTI) isn’t necessarily what you should spend on a home and a mortgage. It’s possible to get a mortgage with a very high DTI ratio, but it’s an imperfect calculation that doesn’t always factor in the intangibles, nor actual takehome pay. There are plenty of recurring costs that don’t show up on a credit report, and minimum credit card payments can fluctuate greatly depending on outstanding balances over time. There’s a good chance your credit card debt will increase once your housing expense rises, making it more difficult to replenish your emergency fund or save for retirement. Additionally, a lot of mortgage calculators aren’t very accurate, and tend to underestimate things like property taxes and homeowners insurance. It might be in your best interest to overestimate those costs. Same goes for mortgage rates – the loan calculator might default to a best-case interest rate that you don’t necessarily qualify for. Again, overestimate when determining how much house you can afford. Sure, get the mortgage pre-approval to see what you can technically qualify for, but don’t necessarily buy a house that expensive. Perhaps leave a buffer for items that aren’t covered in that calculation, like the utilities and the unanticipated home repairs that can eat into your monthly budget. For things like chimneys, pool/spa, roof, etc. Speaking of repairs, make sure you conduct a thorough home inspection when you go under contract to better anticipate any future costs, or perhaps to get a credit before you move in. For example, figure out if the roof is looking like it’ll need to be replaced sooner rather than later, or if a remodel will likely be necessary in the not-too-distant future. There’s a reason condo associations charge monthly HOA dues – they know these costs will come up eventually, and budget accordingly. Most homeowners in single-family homes aren’t required to set aside money each month, but will likely face the same issues. It can be pretty dangerous if no money is put in a savings account for these occasions. A home warranty can also be helpful during the first year or two to cover any unexpected breakdowns, and the seller might even pay for it. Also consider your future, aka your retirement. Make sure you have money left over to fill your 401k or IRA, even if you do plan to use your home as a nest egg one day. Home selling costs are also greatly underestimated. Diversification is good, and as you may recall from the massive housing crash seen about a decade ago, home prices can go both up and down. Lastly, don’t make positive assumptions, like you’ll be making more money in the future, because it may not pan out. What is certain is that your mortgage payments will keep coming, as will the many other bills that accompany homeownership. If you want to keep your home long-term, and also enjoy other things outside of it, budget accordingly. This can lessen your chances of becoming house poor, even if things do take an unexpected turn.